The Securities Act of 1933 is also known as the "Truth in Securities Act" and the "Federal Securities Act", or just the "1933 Act". Its goal was to increase public trust in the capital markets by requiring uniform disclosure of information about public securities offerings. The primary drafters of 1933 Act were Huston Thompson, a former Federal Trade Commission (FTC) chairman, and Walter Miller and Ollie Butler, two attorneys in the Commerce Department's Foreign Service Division, with input from Supreme Court Justice Louis Brandeis. For the first year of the law's enactment, the enforcement of the statute rested with the Federal Trade Commission, but this power was transferred to the SEC following its creation in 1934. (Interestingly, the first, rejected draft of the Securities Act written by Samuel Untermyer vested these powers in the U.S. Post Office, because Untermyer believed that only by vesting enforcement powers with the postal service could the constitutionality of the act be assured.) 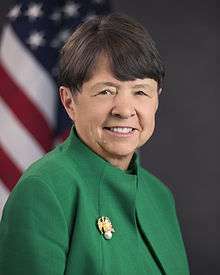 The law requires that issuing companies register distributions of securities with the SEC prior to interstate sales of these securities, so that investors may have access to basic financial information about issuing companies and risks involved in investing in the securities in question. Since 1994, most registration statements (and associated materials) filed with the SEC can be accessed via the SEC's online system, EDGAR. In October 2001 the SEC wrote to CA, Inc., covering 15 items, mostly about CA's accounting, including 5 about revenue recognition. The chief financial officer of CA, to whom the letter was addressed, pleaded guilty to fraud at CA in 2004. In the latest Center for Effective Government analysis of 15 federal agencies which receive the most Freedom of Information Act (United States) (FOIA) requests published in 2015 (using 2012 and 2013 data, the most recent years available), the SEC was among the 5 lowest performers, earned a D- by scoring 61 out of a possible 100 points, i.e. did not earn a satisfactory overall grade. It had deteriorated from a D- in 2013. ↑ FY 2014 Congressional Budget Justification (PDF). 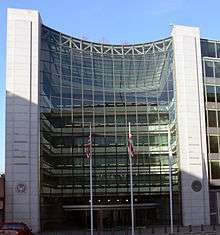 U.S. Securities and Exchange Commission. 2013. p. 14. ↑ "The Role of the SEC". Investor.gov. 1 2 "Blue Sky laws". Seclaw.com. July 7, 2007. Retrieved March 1, 2013. 1 2 Seligman, Joel (2003). The Transformation of Wall Street. Aspen. pp. 45, 51–52. ↑ "Securities Act of 1933" (PDF). Retrieved March 1, 2013. ↑ "Securities Exchange Act of 1934" (PDF). Retrieved March 1, 2013. ↑ "Current SEC Commissioners". Sec.gov. December 17, 2012. Retrieved March 1, 2013. ↑ Orol, Ronald D., "Schapiro to step down from SEC", MarketWatch, November 26, 2012. Retrieved November 26, 2012. ↑ "National Association of Securities Dealers". Finra.com. Retrieved March 1, 2013. ↑ "How does the NASD differ from the SEC?" Investopedia. Investopedia Inc.
↑ Lemke and Lins, Regulation of Investment Advisers (Thomson West, 2013 ed. ); Lemke, Lins and Smith, Regulation of Investment Companies (Matthew Bender, 2013 ed.). ↑ "How the SEC Protects Investors, Maintains Market Integrity, and Facilitates Capital Formation (Securities and Exchange Commission)". Sec.gov. Retrieved March 1, 2013. ↑ Protess, Ben (February 11, 2013). "S.E.C. 's Revolving Door Hurts Its Effectiveness, Report Says". Dealbook.nytimes.com. Retrieved March 1, 2013. ↑ Schroeder, Peter (January 29, 2013). "SEC names new inspector general – The Hill's On The Money". Thehill.com. Retrieved March 1, 2013. ↑ Greene, Jenna,"The Conversation Stopper: SEC Inspector General H. David Kotz: Staffers may not like riding the elevator with him, but the SEC is taking his advice", Corporate Counsel, July 27, 2011. Retrieved August 18, 2011. ↑ "Office of the SEC Whistleblower". Sec.gov. Retrieved 2013-12-05. This article incorporates text from this source, which is in the public domain. ↑ http://www.sec.gov/about/offices/owb/annual-report-2012.pdf This article incorporates text from this source, which is in the public domain. ↑ "Fast Answers: Comment Letters". SEC.gov. Retrieved October 16, 2015. ↑ "Filing Review Process". SEC.gov. Retrieved October 16, 2015. 1 2 3 Gretchen Morgenson (May 28, 2008). "Deafened by the S.E.C. 's Silence, He Sued". The New York Times. ↑ Lauren Tara LaCapra (September 17, 2008). "Naked-Shorts Ban Gets Chilly Reception". The street. ↑ Ellis, David (September 17, 2008). "Regulator enacts new ruling banning 'naked' short selling on all public companies.". CNN. Retrieved May 26, 2010. ↑ Jason Breslow (Director) (April 8, 2014). "Is SEC "Fearful" of Wall Street? Agency Insider Says Yes". Frontline (U.S. TV series). PBS. Retrieved December 14, 2014. ↑ Schmidt, Robert (April 8, 2014). "SEC Goldman Lawyer Says Agency Too Timid on Wall Street Misdeeds". Bloomberg. Retrieved December 14, 2014. ↑ Kidney, Jim (2014). "Retirement Remarks" (PDF). SEC Union, NTEU Chapter 293. Retrieved November 20, 2014. ↑ Chung, Joanna (December 17, 2008). "Financial Times: SEC chief admits to failures in Madoff case". Ft.com. Retrieved March 1, 2013. ↑ Moyer, Liz (December 23, 2008). "Could SEC Have Stopped Madoff Scam In 1992?". Forbes. Archived from the original on February 1, 2009. Retrieved December 24, 2008. ↑ Weil, Jonathan. "Madoff exposes double standard for Ponzi schemes". Bloomberg News. Greater Fort Wayne Business Weekly. Retrieved December 26, 2008. ↑ Serchuk, David (December 22, 2008). "Love, Madoff And The SEC". Forbes. Retrieved December 24, 2008. ↑ Labaton, Stephen (December 19, 2008). "Unlikely Player Pulled Into Madoff Swirl". The New York Times. ↑ "Little faith in regulators and rating agencies, as LP demand for alternatives cools off, finds survey". ↑ Markopolos, H (2010). No One Would Listen: A True Financial Thriller. John Wiley & Sons. pp. 55–60. ISBN 0-470-55373-1. ↑ Kurdas, Chidem. Political Sticky Wicket: The Untouchable Ponzi Scheme of Allen Stanford. 1 2 Blaylock D. (June 2010). SEC Settles with Aguirre. Government Accountability Project. ↑ Choice of Mary Jo White to Head SEC Puts Fox In Charge of Hen House. Rolling Stone. ↑ Committee on Finance, Committee on the Judiciary.The Firing of an SEC Attorney and the Investigation of Pequot Capital Management. U.S. Government Printing Office. ↑ "Preventing Crashes: Lessons for the SEC from the Airline Industry". January 6, 2015. Retrieved January 6, 2015. ↑ Johnson, Fawn. (December 17, 2009) "Group Alleges Slack SEC Response to Internal Watchdog". NASDAQ. ↑ Brian, Danielle. 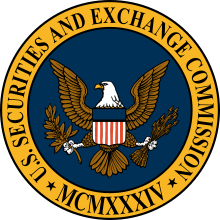 (December 16, 2009) "POGO Letter to SEC Chairman Mary Schapiro regarding SEC's failure to act on hundreds of Inspector General recommendations". The Project On Government Oversight Website. 1 2 Schmidt, Robert (January 25, 2013). "SEC Said to Back Hire of U.S. Capitol Police Inspector General". Bloomberg. Retrieved February 10, 2013. 1 2 3 Schmidt, Robert; Joshua Gallu (October 26, 2012). "Former SEC Watchdog Kotz Violated Ethics Rules, Review Finds". Bloomberg. Retrieved February 10, 2013. 1 2 Robert Schmidt and Joshua Gallu (October 6, 2012). "Former SEC Watchdog Kotz Violated Ethics Rules, Review Finds". Business Week. Retrieved February 12, 2013. ↑ Sarah N. Lynch (November 15, 2012). "David Weber Lawsuit: Ex-SEC Investigator Accused Of Wanting To Carry A Gun At Work, Suing For $20 Million". The Huffington Post. Retrieved February 10, 2013. ↑ "David Kotz, Ex-SEC Inspector General, May Have Had Conflicts Of Interest". The Huffington Post. October 5, 2012. Retrieved February 10, 2013. ↑ Johnson, Carrie, "SEC Documents Destroyed, Employee Tells Congress", National Public Radio (transcript and audio), August 18, 2011. Retrieved August 18, 2011. ↑ Regulatory Structure Archived November 18, 2007, at the Wayback Machine. ↑ U.S. Treasury Archived December 3, 2010, at the Wayback Machine. ↑ "National Archives". Archives.gov. Retrieved March 1, 2013. ↑ "National Securities Markets Improvement Act". AccreditedInvestors.net.